Last week one of my good friends from high school had a farewell party. As a Korean man, he has to serve in the military for the next 21 months. Since he has been feeling down and dazed for weeks, we thought it was a good idea to bring him to a cheery place. After eating a full meal at a Thai restaurant, we moved to a pocha nearby. 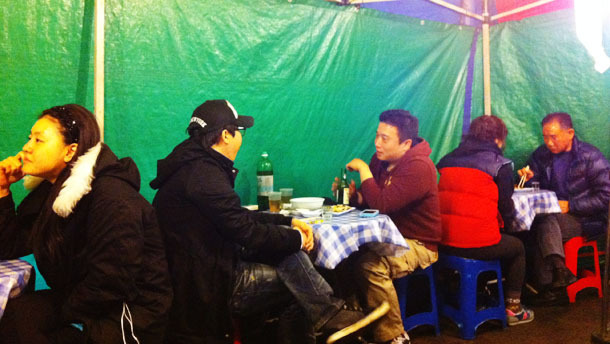 Pocha is a shortened term for its full name, pojangmacha, which literally means “covered wagon.” The term applies to a wide array of “covered wagons” from small tteokbokki (rice cakes in spicy sauce) and fish cake vendors on the street to fancy indoor restaurants that sell alcohol and simple food. This particular pocha we went to is literally a tent on the street. It’s not easy to find these kinds of pochas in Seoul anymore because of its unkempt and dodgy looks. Pochas are usually for post-meal snacking and drinking. 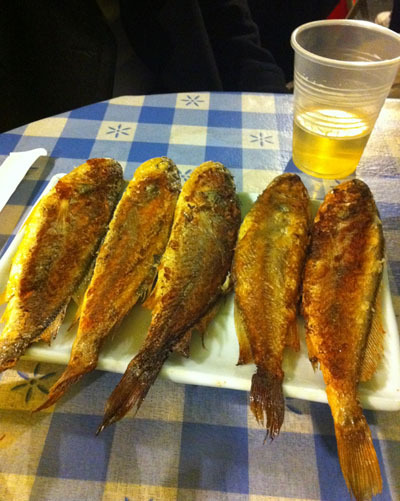 (Although some food looks like it can well be a proper meal, Koreans don’t consider food without rice a full meal). We started with jogi (yellow croaker in English). This was the first time I had jogi in a pocha; I usually order mackerels, but this was a good choice. Not too salty and crispy on the outside—it was a perfect starter. 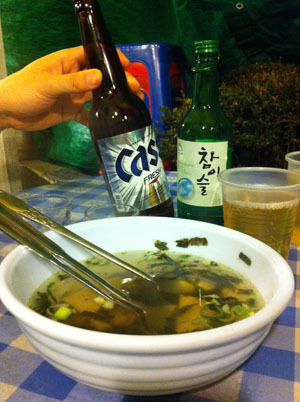 The warm broth is offered for free and can be refilled. Usually when I come here I order noodles, but since this was a special day, I let my friend order what he would miss the most: soondubu and ramyeon. The owner gave us ramyeon for free when he learned our friend is going away. 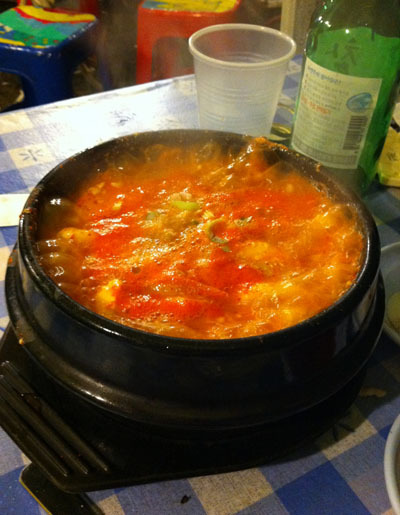 The soondubu and ramyeon were made fresh in a wok and maybe that was why it was extraordinarily good. 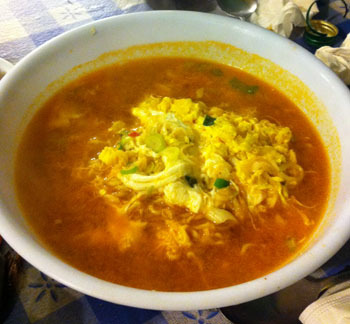 And if you haven’t tried putting ramyeon in soondubu before, well, you definitely should try. After drinking several plastic cups of soju and beer cocktail (called “somaek”) we sang the famous army farewell song for the (un)lucky guy. 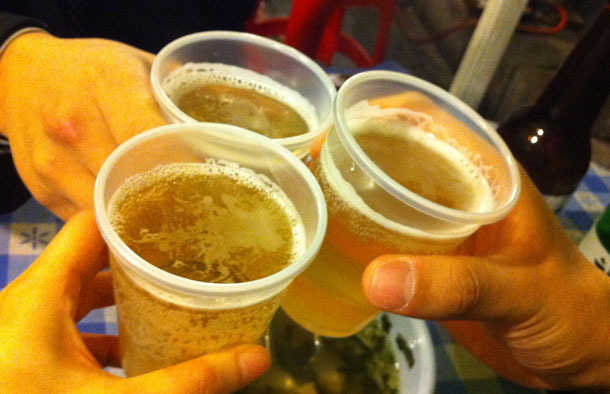 Then one of us asked a couple of people on the next table to give our friend a toast for his well-being in the army. They got up and wished him good luck. It was all warm and fuzzy and it wasn’t all due to alcohol. We will miss you too, bro. Take care and see you on your next vacation. 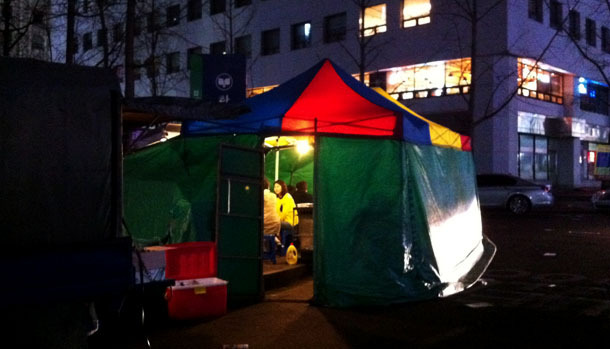 This entry was posted in Seoul, Taste and tagged justine, pocha, street food, taste. In rain or shine… What a great outdoor tradition. I see why you don’t want to leave Seoul!